The mitochondrion is an organelle that has a double membrane and consists of cristae and matrix. It is an organelle that occurs in almost all eukaryotic cells, both plant and animal cells. The cristae are elaborate folds that are formed from the inner membrane. Their function is to increase the surface area for ATP production during the last stage of cellular respiration. The matrix is a gelatin type substance found within the mitochondrion. The matrix contains mitochondrial DNA (mtDNA), molecules involved in chemical reactions (including enzymes), and ribosomes for protein synthesis. The mitochondrion is the organelle in which aerobic cellular respiration occurs in the cell, aside from this function they also do store calcium and play a role in cell signaling. 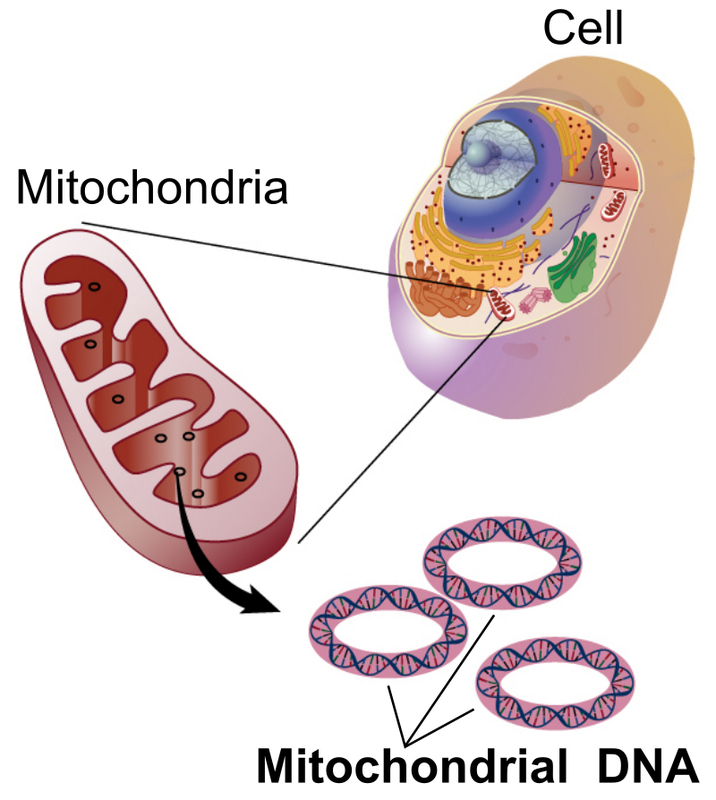 Mitochondria are also involved in heat production, or thermogenesis. During respiration sugars are broken down through a series of enzymatic reactions and carbon dioxide and water are produced in the process. The Krebs cycle (also known as citric acid cycle), of cellular respiration occurs in the matrix of the mitochondrion. This is the second stage of cellular respiration. The first stage of respiration, glycolysis occurs in the cytoplasm. The end product of those reactions enters the mitochondrion where it enters the Krebs cycle. The final stage of cellular respiration is the electron transport chain and oxidative phosphorylation which occurs on the cristae of the mitochondrion. The number of mitochondria found in any given cell depends on where the cell is, so for instance liver cells and muscle cells may have 1000s of mitochondria because these cells are very metabolically active. A few cells, such as erythrocytes do not have mitochondria at all. A plastid is an organelle with a double membrane that is found in some eukaryotic cells and usually contains pigments or stores food. 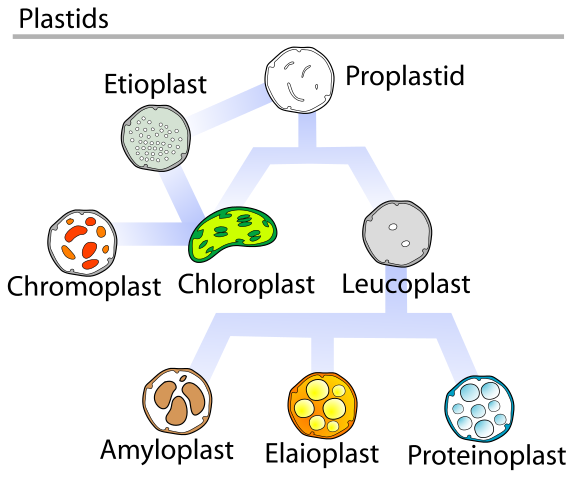 Plastids are not found in animal cells. Leucoplasts: These plastids have no color, and function in storing different molecules. Leucoplasts are further divided into different types depending on the type of molecule they store. Amyloplasts store starch and are involved in some biosynthetic processes. Chloroplasts: These plastids are green because they contain chlorophyll for photosynthesis; they also contain DNA. They have internal membranes known as thylakoids surrounded by stroma (similar to, but not the same chemically as the matrix of mitochondria). The thylakoids stack together to form grana and they function in the electron transport chain part of photosynthesis. Similar to the mitochondrial cristae, thylakoids increase the surface area for the chemical reactions that occur. During photosynthesis, water and carbon dioxide are used by the chloroplasts along with light, in order to form glucose by a series of chemical reactions. Chromoplasts: These are red, orange or yellow in color due to the presence of carotenoid pigments which may be carotenes or xanthophylls. Chromoplasts are often formed from the differentiation of another plastid such as a chloroplast. The differentiation of chromoplasts from chloroplasts occurs as a fruit ripens. The colors of flowers are also due to chromoplasts, and these colors are important in attracting pollinators to the flower. Mitochondria are found in both plant and animal eukaryotic cells while plastids are not found in animal cells. Mitochondria have cristae and matrix while plastids do not have cristae or the same type of matrix; chloroplasts have thylakoids and stroma. All mitochondria have inner membranes while only some plastids have inner membranes. Plastids can vary in color depending on what they do and what pigments they contain, while mitochondria do not vary in color. Some plastids are adapted for storing biological macromolecules while mitochondria are not adapted for storing biological macromolecules. 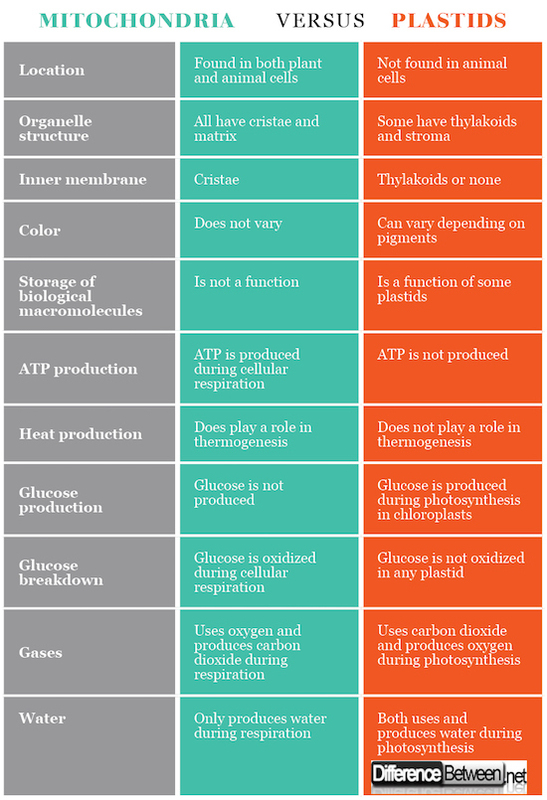 Mitochondria are involved in cellular respiration in which ATP is formed while plastids are not involved in cellular respiration. Mitochondria play a role in thermogenesis while plastids do not play a role in thermogenesis. Plastids can be involved in glucose production by photosynthesis while mitochondria are not involved in glucose production. Broken down in mitochondria during oxidation, to form ATP, while it is formed in chloroplasts (plastids) using ATP. Chloroplast plastids use carbon dioxide and release oxygen while mitochondria use oxygen and release carbon dioxide. Chloroplasts uses and produces water during photosynthesis, while mitochondria only produces and does not form water during respiration. Mitochondria occur in most animal and plant cells while plastids do not occur in any animal cells. Mitochondria have functions such as aerobic cellular respiration, thermogenesis, and cell signaling. There are different types of plastids with slightly different functions, for instance chloroplasts function in photosynthesis while leucoplasts function in food storage. Some plastids like chloroplasts have a double inner membrane. Plastid color can vary depending on pigments that are present, and one plastid can differentiate into another plastid. While mitochondria are involved in producing ATP from breaking down of glucose, chloroplast plastids use ATP to produce glucose. Dr. Rae Osborn. "Difference Between Mitochondria and Plastids ." DifferenceBetween.net. March 13, 2018 < http://www.differencebetween.net/science/biology-science/difference-between-mitochondria-and-plastids/ >. Kilgour, O.F.G. Mastering Biology. London: MacMillan Press, 1982. Print. Raven, Peter H, Ray F. Evert, and Susan E. Eichhorn. Biology of Plants, 4th edition. New York: Worth Publishers, 1986. Print.